Let's talk some beauty today! If you guys follow me on snapchat and instagram, you must have seen how excited I was to try out the new Illamasqua collection. I have been using the brands' products for a long time now and I'm a huge fan of some of the products like the bronzer powder and the Matt lipsticks. Highlighting powder in OMG (Champagne) - I absolutely loved this one! It's lightweight texture gives me a natural glow over light foundation or tinted moisturizer. And it's long- lasting. Brow Bull : Great for thin and light eyebrows as it adds definition. I have thick eyebrows so it's a bit sticky on me. But tried and tested on my sisters and it's perfect for light ones! The vital palette: Four amazing shades of matte powder eye shadows - perfect for that everyday natural look! Nail Veil : Three words for this one! Perfect Classy Nails. The collection includes everyday makeup products that are subtle and are best used for the famous 'natural glow look'. The collection accentuates fresh skin and defined brows and embraces beauty in its natural form. For all you ladies that are looking for that perfect everyday glowy makeup, look out for this one. The best part is that it is long lasting which the brand is commonly known for. 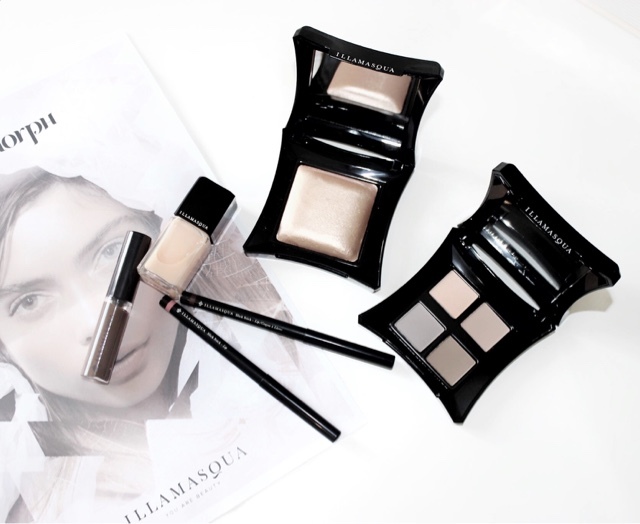 So get your Illamasqua on and happy shopping! Hey, i really wish to try the products and as i am from Philippines i generally shop from Sephora for all beauty products so is this collection available over there? I generally get the products from Sephora at better prices using Sephora coupons so i definitely try to check for the collection over there and get the listed to try for sure.